Leaks about the Google’s Pixel 3 lineup of smartphones have started floating on the web with the latest one being the display sizes. According to Steve H (also known as OnLeaks), the Pixel 3 will have a 5.3-inch display without a notch on the front, while the bigger Pixel 3 XL will sport a 6.2-inch notched display. The tipster is known for releasing some of the accurate CAD renders of upcoming smartphones months before the original launch dates. If this information turns out to be true, then the Pixel 3 will be the compact smartphone we’ve been waiting for because Google will adopt the latest 18:9 display aspect ratio. The Pixel 2 arrived with a 16:9 screen whereas the Pixel 2 XL had an 18:9 screen. Google faced a lot of criticism for not opting the 16:9 screen on the Pixel 2, but that seems to be not an issue with the Pixel 3. The Google Pixel 3 devices are also said to sport stereo speakers on the front, same as their predecessors. 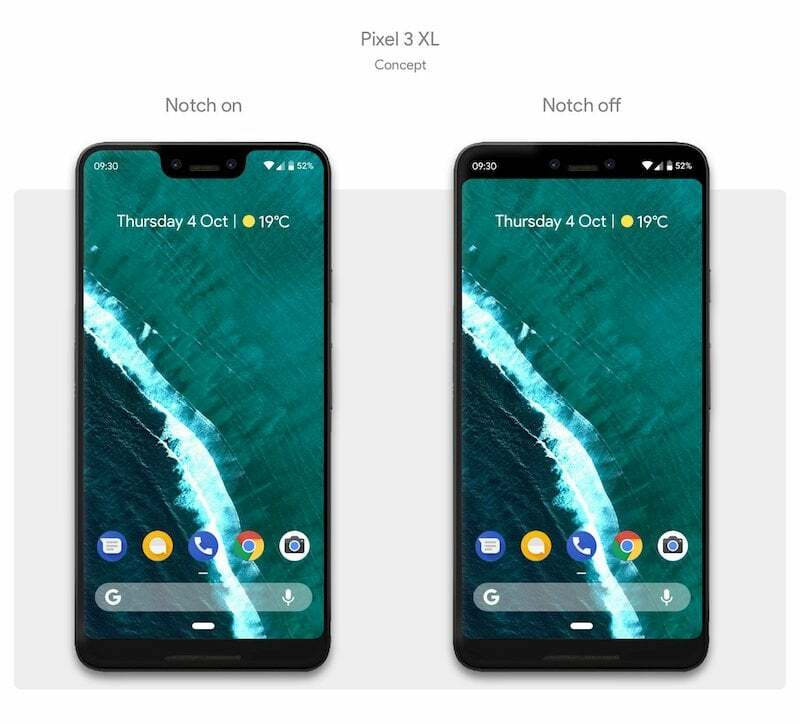 Google adopting notch on its smartphones will not come as a surprise because the search giant has added notch functionality to Android P itself, hinting at the presence of notch display on the Pixel 3. Another recent report highlighted that Google would be solely manufacturing the Pixel 3 smartphones with the help of FIH Mobile, a subsidiary of Foxconn. Thanks to the HTC’ smartphone business, Google will be developing the Pixel 3 smartphones in-house, unlike earlier where other brands such as LG, Huawei, HTC manufactured devices for the company. Furthermore, it is also expected that Google is working on a mid-range Pixel device with Snapdragon 710 Mobile Platform on board. Its unknown at the moment whether Google is planning to release the mid-range device alongside the Pixel 3 devices in Q3 2018. Google is also considering to release its smartphones a bit earlier than the usual timeline, maybe in September 2018 itself. The devices will, of course, come with the Snapdragon 845 SoC under the hood along with upgraded cameras. So why does the XL still have bezels? Seems like Pixel 3 is a good buy over the 3XL. It doesn’t look hideous.